After my weekender in Marrakech (see here) I jumped on a very old and rickety bus packed full of locals and the occasional tourist to the seaside city of Essaouira. Located to the west of Marrakech, Essaouira is well known for it's fishing community, and to the surprise of some, is a paradise for surfers chasing the perfect wave. 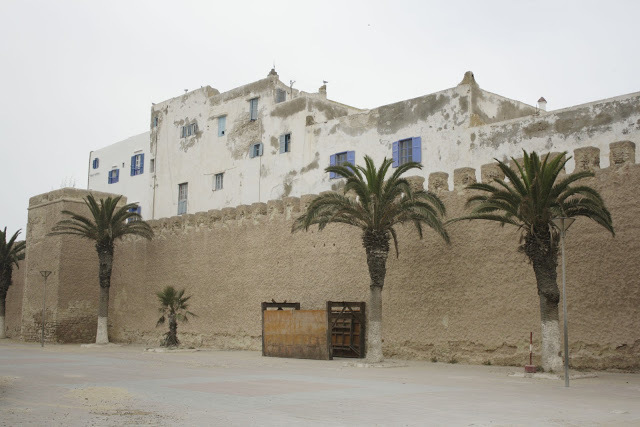 The city is also fondly known by its Portuguese name of Mogador, the Berber name meaning 'the wall', in reference to the fortress walls that many years ago enclosed the city from unwanted intruders. A firm favourite for those visiting Morocco, Essaouira is the kind of city where you take on the cool sea breezes with aplomb and find yourself relaxing fairly quickly as you soak up the atmosphere. A postcard perfect city, the locals of Essaouira are super laid back which adds to the charm of the fishing city. When you arrive make your way down to the fishing port; it's a mighty site when the fisherman come in off their boats to sell their catches of the day. The smell from the fish is intense, as is the hustling by locals for the best price. When I went to Essaouira, I found two to three nights was plenty of time to explore the city, have a swim in the ocean, sample Moroccan delicacies and meet some friendly locals. There are only a handful of hotels within the walls of the city, so if you want to stay somewhere along the sea front there are some really gorgeous international hotels to choose from. Easily reachable by bus, it's best to pre-book your trip a couple of days before your departure from Morocco. If you're taking a surf board on the bus, be prepared to pay a little more.